Finally, I am back after battling it out with the flu, and have managed to regain full health just as the sun has decided to show itself here in London! The jeans I am reviewing today are the perfect accompaniment for the beautiful weather right now. They are a gorgeous pale blue stripe with a slight nautical hint and an easy and relaxed look. These are Current Elliott’s Stiletto Moonbeam Striped Skinny Jeans. If you are interested in details on the fit of these jeans please take a look at my previous review here – which are the same style in a different colour. 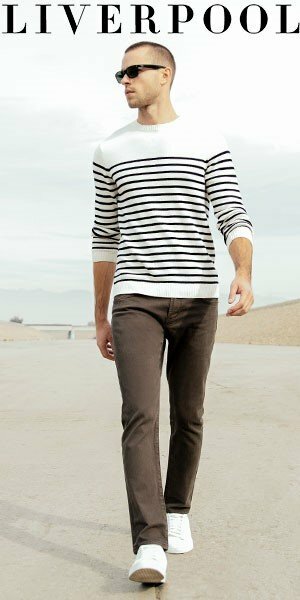 Now, I have to say that for those of you who are looking to go down the stripey jeans avenue this summer then these are the perfect first step. They are made up of several different shades of blue and a varied thickness of lines but remain very subtle and relaxed and very wearable! The subtlety and colour means they are great for everyday wear and work with so many outfit combinations. They look great with flat sandals and floaty tops for a chilled out summer look or can be dressed up with heels for an evening or more glamorous feel. The length can also vary as I have turned these up for a more cropped look. These are actually a size 27 which is one up from my usual style, but the slightly baggier fit on the hips means they have a more easy going and comfortable fit. If you want them super tight then go for your correct size as they fit true to the standard. The only negative thing I have to say about these is the same as the previous pair – I feel like the way the stripes meet at the back makes them a bit unflattering from behind. I don’t think any girl really wants jeans that make her bum look wider and these seem to do just that…! Otherwise a cool pair of jeans for the summer months. The Current Elliott’s Stiletto Moonbeam Striped Skinny Jeans reviewed here are available online from Glassworks Studios.